Last year, the photo contest during the Great Backyard Bird Count -- organized by Cornell Lab of Ornithology -- generated more than 6,000 entries. Now we can enjoy the winning images. The contest encompasses winners in six categories: overall, behavior, composition, group, habitat and people. Each category has a first-, second-, third-, fourth- and fifth-place winners as well as nine to 26 honorable mentions. That's a feast for our eyes! 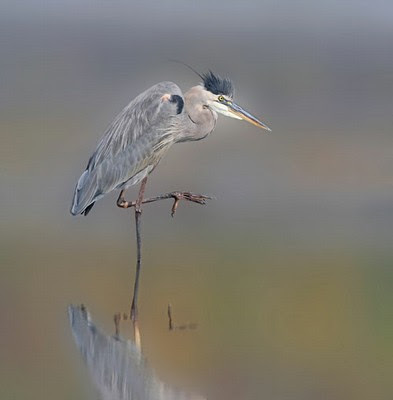 Lynne Marsho of Illinois won first place overall with this Great Blue Heron. Congratulations, Lynne! Have you signed up for the 2010 Great Backyard Bird Count? It's scheduled for Feb. 12-15. You can learn more details in this video. If you enjoy photo contests, consider WildBird's annual competition. For details about the rules and prizes, look in the March/April 2010 issue, available in early February. You can see previous winners here. 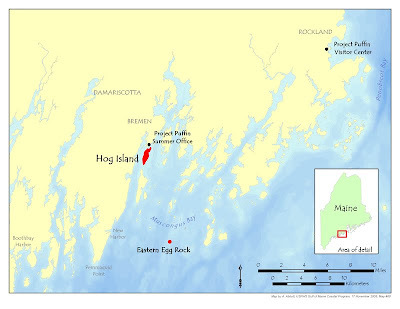 National Audubon Society recently announced that it will open Maine's Hog Island camp in 2010 for four adult sessions and one teen session. First opened in 1936, the camp on Muscongus Bay closed in 2009 but will offer a late-May 2010 session for adult birders. In the first "Maine Seabird Biology and Conservation" session, adults can work with Dr. Stephen Kress and Project Puffin biologists for seabird censuses on several Muscongus Bay nesting colonies. Campers also will learn about seabirds' lives and migrations. The same program will be offered in mid-September and serve as a bookend for the season. The two other adult sessions are Field Ornithology I and Field Ornithology II during consecutive weeks in June. The roster of camp instructors for various sessions includes Pete Dunne of Cape May Bird Observatory, Lang Elliott of Nature Sounds Studio, Kenn Kaufman of Kaufman Field Guides, Kim Kaufman of Black Swamp Bird Observatory, and author and ornithologist Scott Weidensaul. For more details, click on the link above. Click on the image to see a larger version of the map. Sesame Street's Big Bird is Giant Golden Condor? Like The New York Times' ArtsBeat blog says in Monday's post: Who knew?? Christmas Bird Count for young birders! 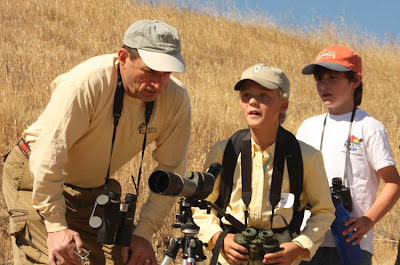 In Northern California two years ago, Sonoma Birding created a half-day Christmas Bird Count program for children ages 8 to 14. The Audubon CBC for Kids runs from 8:30 a.m. to 2:30 p.m., not from midnight to midnight as in the traditional CBC, and the suggested count dates fall between Dec. 10 and Jan. 15. Sonomabirding.com provides many helpful details in the link above, and the framework sounds similar to the rules laid out for youth teams in New Jersey's World Series of Birding and the Great Texas Birding Classic. As mentioned in a recently Bird Education Network bulletin, birding organizations in locations around the United States are adopting the framework and adapting it to their needs. Will you help get more young birders involved in your area? Secretary of the Interior Ken Salazar, Assistant Secretary for Fish and Wildlife and Parks Tom Strickland and U.S. Fish and Wildlife Service Director Sam Hamilton today announced that the brown pelican, a species once decimated by the pesticide DDT, has recovered and is being removed from the list of threatened and endangered species under the Endangered Species Act. The brown pelican was first declared endangered in 1970 under the Endangered Species Preservation Act, a precursor to the current Endangered Species Act. Since then, thanks to a ban on DDT and efforts by states, conservation organizations, private citizens and many other partners, the bird has recovered. There are now more than 650,000 brown pelicans found across Florida and the Gulf and Pacific Coasts, as well as in the Caribbean and Latin America. 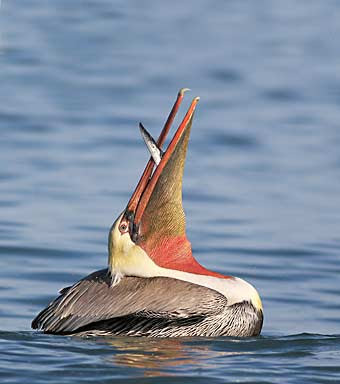 The Fish and Wildlife Service removed the brown pelican population in Alabama, Georgia, Florida, and northward along the Atlantic Coast states from the list of endangered species in 1985. Today’s action removes the remaining population from the list. What's your favorite BrPe experience? I really enjoy seeing a flock skim the waves along Huntington State Beach, near the Santa Ana River outlet. Seeing them plunge into the water always makes me stop and gasp. Congratulations to Clare Kines! He earned top honors in this month's First Friday fiction contest. By crafting an intriguing 500-word tale, Clare earned the chance to receive a recently published birding book of his choice. No doubt the book will provide good reading fodder during the dark arctic winter. Please participate in the December contest! 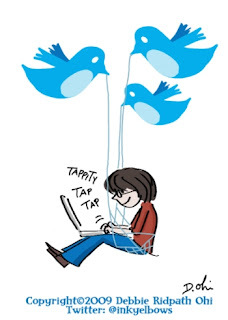 Mark Dec. 3 as the deadline for your fictional story about birds, birders or birding. Here, then, is Clare's story, "Coffee?" Tye pulled his jacket tighter around his neck. “Damn wind,” he said to no one in particular. He stomped his feet, willing circulation there, and wondered if he’d get any visitors today. They were a strange lot, the bird people, traveling all this way to see a gull. Of course, once he stopped to think about it, his was a strange job. Tye was an egg guard, hired by the Feds -- not that he didn’t mind the work, but there couldn’t really be people that would come all this way to steal a bird’s egg. No matter how rare it was. At least he wouldn’t screw up this job. He’d come up north to make his way in the world, his parents happy to see him out of the house. They’d still hoped he’d go on to University, but he could barely handle high school. They’d nagged at him constantly to get out of the basement, so he did. Took the Pinto they’d given him when he got his licence and pointed it to Thompson. He found work right away, in the mine. Hated every minute of it. When the foreman caught him sleeping instead of knocking loose rock from the ceiling, he was fired. That night in the bar, he fell in with some tourists, and before he knew it, he was on the train. Brian, who worked for the port, let him crash on his couch and told him about the egg guard gig. He shook his head again as he raised his binoculars, puzzled by the absurdity of it all. Still it was a beautiful gull, a Ross’s Gull. Until three weeks ago, they were all seagulls to him. This one was small, dainty almost, and he’d never had dreamed a gull could have a pink breast, but these ones did. He looked up when he caught sight of the dust. The plume of dust told him someone was coming, and soon the taxi pulled up. He smiled when he saw the two Germans get out. They’d been coming every day for the last week to see the bird. Different than the others, they spent more time talking with him, and they always brought coffee. Today was their last day in Churchill. He was glad for the company of someone who preferred him to the bird. Dieter poured him coffee, while Brigit nodded hello but stood on the opposite side of the road, already raising the binoculars she wore. Dieter looked off the other way, towards the coast, lines creasing his forehead. There was a bear close, Dieter told him, pointing to the coast, and they both scanned the horizon. It was early for bears, and after fifteen minutes, they still hadn’t seen anything. Soon Dieter was pouring him more coffee. Brigit joined them, so he handed her their thermos. He had already turned back to the coast as she deftly took off the bottom of the jug and slid the dark speckled egg inside. First Friday fiction contest returns! With a nudge from Bev Robertson (@BirdingBev) and Behind the Bins/Murmuring Trees, WildBird on the Fly welcomes the return of First Friday, a fiction contest for birders! Bev earned top honors twice -- and you can see why here and here -- as did Clare Kines of The House and Other Arctic Musings (his winning stories appear here and here). * You write a 500-word piece of fiction. * I post the winning entry on Friday. * The winner receives a recently published birding book. With two or more entries on Thursday, we'll have a contest and a winner. I hope that you'll participate and share the news! Good luck!